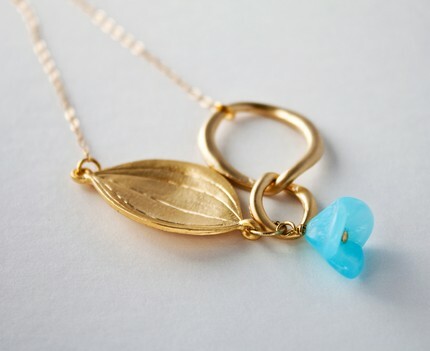 Menuet Designs has so graciously offered the beautiful Leaf and Double Link Necklace with Aqua Blue Flower as the first giveaway prize for our Motherhood Week. Isn't it gorgeous? To be entered into the drawing for this lovely necklace, please visit Menuet Designs, then come back here & tell me something else from their shop that you love. Please remember to leave your e-mail address with your comment. As always, followers of this blog get an extra entry. So if you follow me, please leave one additional comment letting me know. You have until May 7th to enter. What a gorgeous giveaway!! I also love Menquet Design's silver branch bracelet. I'm also a follower. I found this blog the other day and fell in love, so happy to see it on my google reader! I love a lot of these but I think the swirly gold earrings are my favorite! I follow in Google Reader too! What a lovely shop they have! One of my favourites is the Gold Branch Necklace, but everything looks so pretty! Thanks for the giveaway! Cherry Blossom Branch Necklace. So pretty! I love the double branch necklace. What a lovely collection! also...i'm kind of a huge fan/follower of yours! So many lovely things, but I really love the butterfly necklace. I also follow your blog and enjoy seeing your creative projects. I love the three pearl and swallow necklace. So pretty! 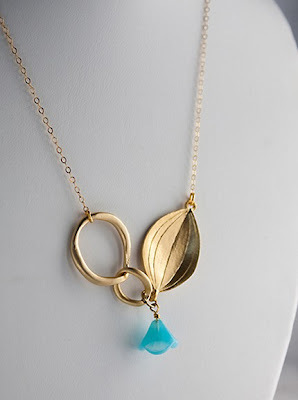 I love the Matis Leaf Necklace--delicate and beautiful! I also follow your blog on my Google Reader. So pretty! I also love the Bubble Necklace with Jade Quartz. I love the Simply Elegant Three Pearl and Swallow Necklace ! I follow you and I will blog about it. Such pretty things! I love the Set Me Free Bird Necklace in White Gold. So much to like, but the one that I kept coming back to was Howlite Teardrop with Gold Leaves Necklace. Well, aside from the fantastic necklace you are giving away, the Double Branch Necklace is my favorite. EVERYTHING is lovely, though. And really unique. i have fallen in love with the silver branch bracelet with swarovski pearls...but everything else is also gorgeous. Definitely the Bird and Leaves necklace. I love pieces with an asymmetrical design. All of their jewelry is lovely. what a fantastic little shop, i have hearted it on etsy! i love the silver branch bracelet a lot but this giveaway necklace is soo lovely too! thanks for the chance to win! What a beautiful shop. It was so hard to choose but I loved the butterfly necklace in gold and white. The bracelets were also very cool. I love the Bird and Leaves Necklace in Gold and White Gold... but I also love the Butterfly one... very different pieces! Sp pretty! Thanks for the giveaway! I adore the three leaf earrings! So cute! What a beautiful necklace! I also love the double branch necklace. The Orchid Flower Necklace in White Gold is gorgeous! Love all the nature inspired pieces! Especially Silver Branch Bracelet with Swarovski Pearls, gorgeous. Love the Single Flower Necklace! The asymmetric look is a modern spin on traditional pearls. my favorite piece is the Lovely Antique Patina Locket! Oh, thank you for steering me towards the Menuet etsy shop. I love all of the asymmetrical necklaces but especially the Bird and Leaves and the Rose in Gold. Quite classy! the lovely antique locket is indeed lovely. I also love the Simply Elegant Three Pearl and Swallow necklace !!! I love the Oak Leaf Bracelet! I love the Antique Teardrop Silver Filigree Leaf Lariat! Well, I love what is posted, but I also like the Timeless Leaf Necklace with the pearls... Thanks! Beautiful! I love the Cascading Leaf Necklace in White Gold. I love the Bird and Circles Bracelet in Gold and Silver. I really love the Tree and Songbird necklace in white gold! I like the Silver Branch Bracelet with Swarovski Pearls. I love the gold filigree butterfly necklace! Very unique and I think it would be a piece I would wear a lot! Love the Filigree flower and turquoise earrings also...! I love the Lovely Antique Patina Locket. I love the five leaf necklace in gold, but I really do think that the one being offered here is my favorite! They're all so pretty and such reasonable prices! And I'm a follower. Thanks to Lesley for directing me to your blog! This is such lovely jewelry. My favorite piece is the Timeless Leaf & Pearl Necklace. Thank you. I'm a new follower on GFC as Sabrita. Thank you. I adore the silver branch bracelet! I totally want the Timeless Leaf and Pearl necklace! love the Bird and Leaves Necklace in Gold and White Gold! thanks for the opportunity! I love the Butterfly Necklace in Gold and Silver! I've hearted her shop so I can come back when I need a pretty gift. I'm also a follower on my google reader! I love the butterfly necklace! I like the Orchid Flower necklace in Gold. I like the Matis Leaf Necklace in White Gold. ooo. I like the three leaf earrings. Thank you for the giveaway! Such cool stuff. I love the three leaf earrings! I love the Lovely Antique Patina Locket! I love the silver branch bracelet! I like the swirly gold earrings. I love the Cascading Leaf Necklace in White Gold. Absolutely gorgeous! And reasonably priced too. Love it! i really like the Butterfly Necklace in Gold and Silver, it is just perfect..!!! the Bird and Leaves Necklace in Gold and White Gold is awesome! sbeinkauf(at)gmail(d0t)com. I like the Tree and Songbird Necklace in White Gold . I like the Oak Leaf Bracelet. I love the single flower necklace. I love the cascading leaf necklace. I adore the "Lovely Antique Patina Locket"! I'm also a follower! Love your blog. The Turquoise Patina Water Leaf Necklace is gorgeous! The butterfly necklace is so very graceful. I love teh water leaf necklace, very pretty. I heart Etsy! I also faved Menuet Designs! Seriously gorgeous pieces!! and affordable. It was a hard decision, but I'd have to say that I am wavering (see, I told you it was a hard decision) between the Silver Branch Bracelet with Swarovski Pearls, the Tree and Songbird Necklace in White Gold, the howlite Teardrop with Gold Leaves Necklace, and the Leaf Necklace in Silver with Aqua Blue Flower and pearl .. I really am indecisive like that! I like Cherry Bloosom Branch. The Antique Teardrop Silver Filigree Leaf Lariat is gorgeous! I love the courting swallows necklace! I am loving all of them, but the Orchid Flower Necklace is my favorite! Dreamy! I love the Gold Branch Necklace. I love the Antique Flower Heart Necklace, simple yet timeless! Thanks for the giveaway. I love the silver branch bracelet and the Turquoise Patina Water Leaf Necklace! Another great giveaway!!!! This is such a great giveaway! There were so many gorgeous necklaces to choose from but my favorite was the bird and leaves in gold and white. I'm adding it to my birthday wish list! I LOVE the silver branch braclet!! Thank you for an amazing giveaway!! 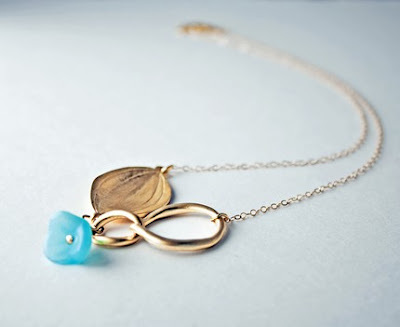 My favorite piece is the one you posted: Leaf and Double Link Necklace with Aqua Blue Flower. The oak leaf bracelet is stunning as well as the necklace. Absolutely beautiful items! Thank you! Wow, I love so many of those pieces. The Silver Branch Bracelet stands out the most, the soft blue beads with the simple silver design is just beautiful. The Cherry Blossom Branch Necklace is stunning! I like their rose in gold necklace! Wow! I love all of her items! I especially like this locket! i absolutely adore the Rose in Gold and Antique Flower Heart Locket! you have amazing talent! I love the Matis Leaf Necklace in White Gold. I love the "Tree and Songbird Necklace in White Gold"
Lovely shop! I also like the orchid flower necklace in gold. Beautiful! And I'm a follower. Thank you! Really liking the Magnolia Flower Lariat with Aqua Chalcedony Briolette! I like the Matis Leaf Necklace in White Gold. I love the light colors & elegant look! I love the gold angel wing bracelet! Beautiful! I love the Orchid Flower Necklace in White Gold! forgot to leave my email address, silly girl. so again, i am in L-O-V-E with the birds and leaves necklace. please, oh please, pick me! I love the Set Me Free Bird Necklace in White Gold. These jewelry designs are absolutely beautiful. I like that it's so artistic and different, truly something Ive never seen before. Case in point: theBird and Leaves Necklace in Gold and White Gold. Adorable.